Benjamin Lax was Professor of Physics at Massachusetts Institute of Technology (MIT) (1965-1986). He was also on staff at MIT's Lincoln Laboratory (1951-1965) and director of MIT's Francis Bitter Magnet Laboratory (1960-1981). In his research, he made major contributions to the understanding of semiconductors, particularly through studies of their energy band structure using cyclotron resonance. December 29, 1915Birth, Miskolc (Hungary). 1941Obtained BS in Mechanical Engineering, Cooper Union, New York (N.Y.). 1944 – 1946Researcher, Massachusetts Institute of Technology (MIT) Radiation Laboratory, Cambridge (Mass.). 1946 – 1951Researcher, Cambridge Research Center, United States Air Force. 1951 – 1965Researcher (1951-1953); Head, Ferrites Group (1953-1955); Head, Solid State Group (1955-1957); Associate Head (1957-1958); Head, Solid State Division (1958-1964); and Associate Director (1964-1965), Lincoln Laboratory, Massachusetts Institute of Technology (MIT), Cambridge (Mass.). 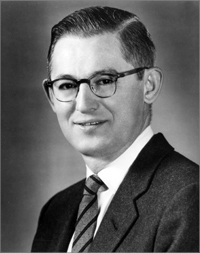 1960Awarded Oliver E. Buckley Condensed Matter Prize. 1960 – 2015Director (1960-1981) and Director Emeritus (1981-2015), Francis Bitter Magnet Laboratory, Massachusetts Institute of Technology (MIT), Cambridge (Mass.). 1963 – 1967Member, Council, American Physical Society. 1964 – 1981Member (1964-1981) and Chair (1966-1968), IEEE (Institute of Electrical and Electronics Engineers)-APS (American Physical Society)-OSA (Optical Society of America) Joint Council on Quantum Electronics. 1965 – 2015Professor of Physics (1965-1986) and Professor Emeritus of Physics (1986-2015), Massachusetts Institute of Technology (MIT), Cambridge (Mass.). 1970 – 1981Member, Solid State Science Panel, National Research Council. April 21, 2015Death, Newton (Mass.). PhD advisor at Massachusetts Institute of Technology (MIT), "The effect of magnetic field on the breakdown of gases at high frequencies." Both employed at Massachusetts Institute of Technology (MIT) Lincoln Laboratory. Researcher; Head, Ferrites Group; Head, Solid State Group; Associate Head; Head, Solid State Division; Associate Director. Obtained PhD (1949). Professor of Physics and Professor Emeritus of Physics. Member, Council and received 1960 Oliver E. Buckley Condensed Matter Prize. Obtained BS in Mechanical Engineering (1941). Member, Solid State Science Panel. Benjamin Lax memoir [sound recording], 1998-2000. Oral history interview with Benjamin Lax, 1986 May 15. Oral history interview with Benjamin Lax, 1991 June 13. Francis Bitter National Magnet Laboratory records, 1957-1987. Oral history interview with Nikolai Gennadievich Basov, 1984 September 14. Physics of quantum electronics; conference proceedings / Edited by P.L. Kelley, B. Lax [and] P.E. Tannenwald. Benjamin Lax Physics Today obituary.